It's not difficult to see how the elephant beetle got its name. Tusk-like horns make the beetles look more than a little like their namesakes. But it's not just their horns that set them apart from other beetles. The beetles truly are elephant-sized when compared with other beetle species, which tend to run much smaller. The three-horned elephant beetle looks like it would be at home roaming the planet with the dinosaurs. The length of the beetle's horns varies depending on whether the beetle is a “major” or “minor” elephant beetle. Major elephant beetles have one long horn with two slightly shorter horns on either side. Side horns on minor beetles are much shorter than the middle horns. Only males have horns: female have small growths on their heads where the horns would be located. Elephant beetles range in size from 2 1/2 to 3 inches long. Elephant beetles live in warm parts of the world, including Florida, southwestern United States, Australia, Mexico, and South and Central America. Tropical rainforests and other forested areas provide the ideal environment for the beetles. Elephant beetles make their homes in trees. Some beetles deposit their eggs high in the trees where the larvae have some protection from predators, while others use compost piles or rotting wood on the ground. Other females take advantage of what nature provides and use old bird nests or holes in trees for nests when laying their eggs. 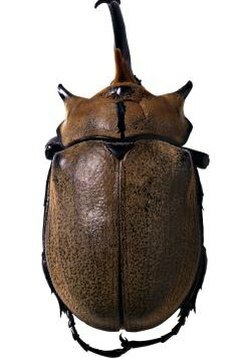 Horns don’t just give the beetles a distinctive appearance: they have a practical purpose that helps the beetle survive. Competition for female beetles can be very intense during mating season. When two male elephant beetles both want the same female, they settle the matter by using their horns to fight. Horns are also useful as tools. The beetles use them to dig into sandy soil to create holes for hiding and to lift up bark to get to the tasty sap underneath. Elephant beetles play an important part in the environmental cycle because they remove dead and decaying organic material. Both the beetles and their larvae prefer their food rotten and decaying. The larvae dines on rotten wood and decaying leaves and roots while they grow. Each larva can eat more than 3 pounds of organic material by the time he reaches maturity. (see ref. 2, para 9) Rotten wood is a staple of the mature elephant beetle’s diet, but the bug also eats sap and fruit.